Paul and Danielle Glass generously donated $1000 to the Dustin Glass Memorial Fund this year. 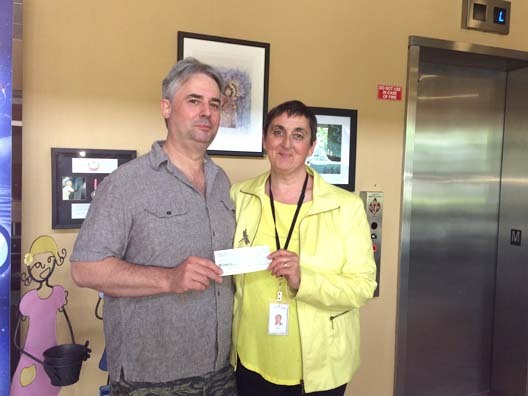 Shown here is Paul Glass and Bernadette Gallagher, Executive Director, accepting the donation. Paul Glass and his family established the Dustin Glass Memorial Bursary to honour Dustin’s memory in 2009, following the loss of their son/brother. This bursary is awarded to youth in care who have successfully obtained their high school diploma, while living on independence. The fund is supported through generous donations by Dustin’s family and Society staff members. Since this fund was established, 29 graduates have been assisted through this bursary. Bursaries will be awarded at the Annual General Meeting on June 14th.